Staying organized in college means more than keeping your clothes and food items neat on your closet shelf or in your underbed storage. A large part of staying organized in college involves keeping track of your college courses, homework, and exams. 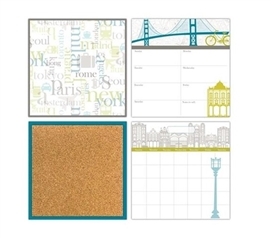 College calendars offer a way to add to your dorm room decor and to stay organized in college. Sticky wall calendars that are dry erase make for great dorm decorations and college organization products! They're cool dorm necessities that take up barely any space in your college dorm room because they stick right on your wall! One college decor idea for college students that are dorming is to decorate their dorm room with a cheap college wall calendar. Dorm wall calendars are popular high school graduation gift ideas that are considered functional college wall decor because they are extremely useful for scheduling your college life. Tell your parents to get you this dorm essential and you'll feel organized and on top of all your college studies. DormCo has a great selection of college calendars with a variety of mounting options. Dorm room décor has never been as easy to find as it is now with DormCo.